Bringing bike share to Los Angeles has been a hot and cold topic going back to the 2008 Democratic Convention in Denver. At the Convention, Bikes Belong set up a temporary bike share for delegates to move around the city. This captured the imagination of then City Council Transportation Committee Chair Wendy Greuel, who rode the bikes and wanted a permanent system in Los Angeles. At the time, LADOT and many members of the bike community warned that the city wasn’t ready for a stream of inexperienced bicyclists to hit the Downtown all at once. Is the city ready today? It’s been less than four years since there was consensus that it was not. Alexis Lantz, the planning director for the Los Angeles County Bicycle Coalition, also believes the city has made great strides in four years. However, Lantz has one suggestion that will make bike sharing that much more accessible to Angelenos. Navin Narang, one of the founders of Bike Nation explains that their goal is to have a system that covers all of Los Angeles and some of the other neighboring cities. For now they are starting with some of the more densely populated areas, which also happen to be places with some of the better bicycle facilities. “I think we can expand beyond this first step, but this is a great first step,” Navin hopes. Los Angeles’ coming bike share system will be one of the largest in the country. Washington D.C. and San Francisco both brag of systems with 1,200 bikes. Chicago has a system with 3,000 bikes. Only New York City, which has a system coming on-line in the very near future, will have a larger system. New York brags of a 10,000 bike system. How about GPS on the bikes, to help the riders navigate? What would be the interface for this on the bike, Steven? Something with a delicate LCD screen, etc? Who will be paying for maintenance and repair costs? The city? This is a private venture, Bike Nation is a for-profit company that maintains its own equipment. yes, its called an iPhone. This is so exciting. LA’s a polycentric city with polycentric neighborhoods, so the bike share model can work well. Good waypointing signage, like what San Francisco and most other bike-friendly cities have, is far preferable. Also, it’s getting increasing easy to use smartphones and GPS. Why add complexity to a machine whose simplicity is one of its great virtues? 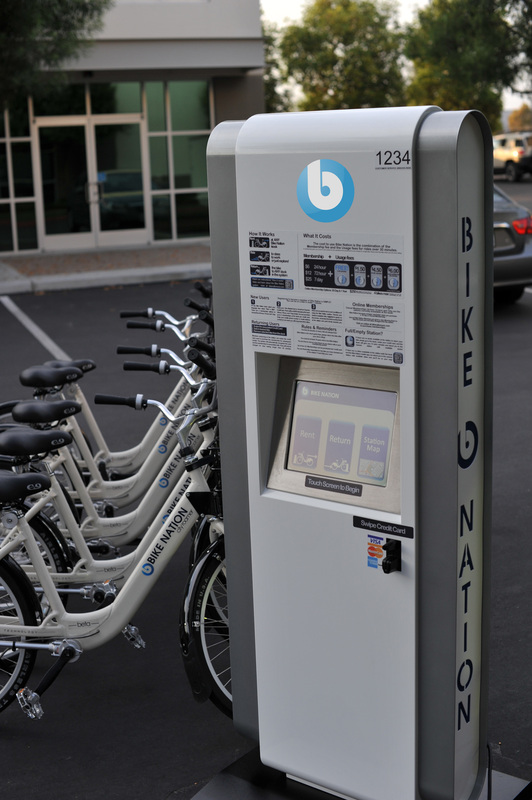 I’m skeptical of Bike Nation USA, a startup whose last installation was in Anaheim, of their financial ability to operate a 4,000 bike system, let alone launch it by the middle of 2014, which is their claim. This is a very aggressive timetable, and since there is no public money involved there really is no leverage from the public as to the speed of the launch. Incidentally I would start in Westwood and Venice first and then move out to Downtown (which could be a huge issue with all of the bums, hills, traffic, deliveries, etc.) and Hollywood. I’m concerned that Bike Nation has never done a installation before, have yet to produce a final bike design, most large scale systems use sponsorship of the bikes or advertising at the stations in order to break even or make a profit, and also that they intend to put the bikes in four spread out areas of the city. Successful bike sharing installations have a density of about 300 meters between stations. Thining out the volume of bikes over four locations, in a city this size, could dilute the popularity of the bicycle sharing due to difficulty in useability. Also, how are they going to keep up with service or repositioning bikes when there is a great distance between stations? Don’t say “bums”. Many are mentally ill, veterans, destitute. I agree that riding on sidewalks is dangerous for, well, pretty much everyone involved, but until the city and it’s drivers (especially those downtown) learn that their car is a weapon against a bike and can share space, those of us on the sidewalks gotta share. I will say for cyclists using the sidewalk, that you need to share space as well, slow down and be cool. Also, be super careful popping of the sidewalk into the street. If you’re on the street, ride within traffic regulations, signal, don’t get all freestyle in traffic. On the sidewalk, give the same response to pedestrian rules. and PLEASE WEAR A HELMET! Transportation in this town is a team sport that only works of we all play by the rules. You should be skeptical, word on the street is, Bike Nation USA doesn’t pay their bills and has already turned off a number of local SoCal manufacturers that were working on this project who have walked away….I think Bike Nation USA is another company that will put cheap product out there and not follow up…from what i saw at CicLAvia, they had bikes that were a mix of brnads, and spray painted with their logo in cheap vinyl….why not B-Cycle, a real american company?? Why, so they can get slaughtered? And helmets? You know they are useless over 20 mph, right? Who the hell is Navin Narang? Many auto vs bicycle could be avoided if: 1) Bike lights during the day–make yourself visible; 2) Obey “traffic laws”–obvious if you are in traffic, if you are riding on sidewalks you are a “pedestrian”=walk the bike through intersections (where do you think most auto vs bicyclist occur?!?!? Certainly not on the sidewalk. ); 3) Safety in numbers–the more drivers are aware of cyclists the safer you will be. Navin Narang is the president of 1st Pacific Holdings, the company that owns Bike Nation. For this to work well, you need supporting infrastructure that makes it easy to use those bikes to get places. As far as I can tell, LA has a LONG way to go in that regard. I’ve already warned NYCDOT (you can ask your colleague Ben, who decided to ban me from Streetsblog NYC) that bike sharing is going to be a MAJOR setback for the livable streets movement in their city. Los Angeles will be no different. LADOT will be making the same mistake as NYCDOT and I will prove it this year. I will most likely be fighting the NYC one, but Los Angeles is close to home, so I will definitely be fighting this one when the time comes. It’s a safety and common sense issue, there are only a handful of bike lanes or bike-share lanes in downtown, other than that you find yourself fighting for your life against crazy cars, crazy bus drivers, etc. I cant tell you the amount of times I’ve been driven off the road, or honked or harassed by drivers who cant process the notion of sharing the road, even if I am “obeying traffic laws”. Do you even bike? It’s not like driving, we can brake on dime, unlike cars that are clunky, obstructive and will likely kill you even at a slow speed if you get hit. I ride on the road about 80% of the time but when I don’t feel safe I’m sure as hell not going to stay on the road. You cant be distracted, texting or yapping on the phone, eating, shaving, or whatever else car drivers do. So dont be scared of me, watch out for the person driving while updating their facebook with BOTH hands. Geez everyone is so skeptical! If some private company is going to come in and throw down a bunch of money on this, who cares, go with it. Take the Sadik-Khan approach–doing something is always better than doing nothing. Sure the program could flop, but so did the first project in DC and they’ve already gone live with a bigger and better bike share system. Bike share is gonna have its kinks to workout, especially in a city like LA, and the sooner we start figuring out what works and what doesn’t the better. The market is so dynamic for these sorts of projects right now, I wouldn’t be surprised to see several competing bike share systems pop up across the city and the county. The best are going to float to the top and take over, and the whole process of getting there will be littered with bikes bikes and more bikes. Bike share will bring infrastructure, or at least it will bring a growing number of people newly exposed to bicycling in LA, and thus make them more susceptible to joining the fight for more infrastructure, which is how any infrastructure even happens in this city in the first place. Good points Ramon. From yesterdays BPIT meeting I learned that LADOT is already thinking about how to implement bicycle infrastructure to support the bicycle sharing. The more butts on bikes, or Bob’s as I like to refer to them, the more riders you end up with. Another example of that is CicLAvia, which is doing a fantastic job of getting people to start bicycling, while building up political and community support for cycling. If Bike Nation is trying to make a profit, without sponsorship of the bikes or advertising at the kiosks, then I would recommend that they raise their prices to the level of DecoBike in Miami, which has turned a profit after the first year. At this point, what has been announced about the Bike Nation bicycle sharing plan for L.A. does not make financial sense for Bike Nation. It’s more expensive to build and maintain a bicycle sharing system than the user fee price structure that has been mentioned for this project. Where did you get that “inside” information from? What Bike Nation did at CicLAvia was provide a FREE bicycle rental service to the public. I believe their bicycles were all one brand of a local bicycle company, Huntington beach bicycle company, which they used because of the short timeline leading up to the event. I agree! I just saw the Bike to work, KTLA highlights on TV the other day…wow…I wish the public would know the truth! I did some research…it turns out the bikes being touted as in Narangs words, …”are proprioritary designed airless composite tires, shaft drive and proprietary designed frame is what makes us different…” Additionally, he was asked about buying the bikes, Narang said you can not purchase as they are proprietary…..what fraud!!! I found the company that ACTUALLY owns the technology…they have been selling bikes for five years their Rep said. The Deco Bikes are also made by the same company, a company called Rugged Cycles! Then I found the shaft is Taiwanese owned…so Bike Nation is appearantly frauding the City!!!! ugh…we so do not need this now! As well, on Bike Nation’s FB page and articles here, they are touting the bikes are Made in the USA. Rugged Cycles confirmed all product was designed by Rugged Cycles, and everything is actually manufactured in Taiwan…..I think Bike Nation will unfortunately fall as they are telling BS to get their company in the door…at least B-Cycle is up front about their bikes….and I was just in Denver….I rode one, and they are all pretty nice. I was in florida a few weeks ago, and the Deco Bikes ride great too….LA needs to get real companies like Alta Bike Share from NYC, or B-Cycles…our community needs this, but also needs honest businesses representing angelinos!!!! I decided I really wanted people to see this in light of the articles all over about Bike Nation having their bikes owned/”proprietary to them”, especially after seeing, the Bike to work, KTLA highlights on TV the other day…wow…I wish the public would know the truth! I did some research…it turns out the bikes being touted as in Narangs words, …”OUR proprioritary designed airless composite tires, shaft drive and proprietary designed frame is what makes us different…” Additionally, he was asked about buying the bikes, Narang said you can not purchase as they are proprietary…..what fraud!!! I found the company that ACTUALLY owns the technology…they have been selling bikes for five years their Rep said. It’s a company called Rugged Cycles! I found the shaft, sussex is Taiwanese owned…so Bike Nation is appearantly frauding the City!!!! ugh…we so do not need this now! I recently saw on Bike Nation’s FB page and articles here on LA street Blog, that is touting the Bike Nation bikes are Made in the USA. Rugged Cycles Rep, confirmed all product was designed by Rugged Cycles, and everything is actually manufactured in Taiwan…..I think Bike Nation will unfortunately fall as they are telling BS to get their company in the door…at least B-Cycle is up front about their bikes….and I was just in Denver….I rode one, and they are all pretty nice. I was in florida a few weeks ago, and the Deco Bikes ride great too….LA needs to get real companies like Alta Bike Share from NYC, or B-Cycles…our community needs this, but also needs honest businesses representing angelinos!!!! I wish LAstreet Blog and KTLA would do some research…it wasn’t hard…but to make sure what they are reporting is correct! It’s so easy to lie online! Keep up the good work, it’s not LAStreet Blogs fault, but this Navin guy…..why can’t we find honest business people to do something wonderful like bring Bike Sharing to our great city!! !